Anna Paquin and Stephen Moyer were spotted headed to The Bing Theatre for the Film Independent at LACMA Presentation of ‘Margaret’ on Tuesday evening. 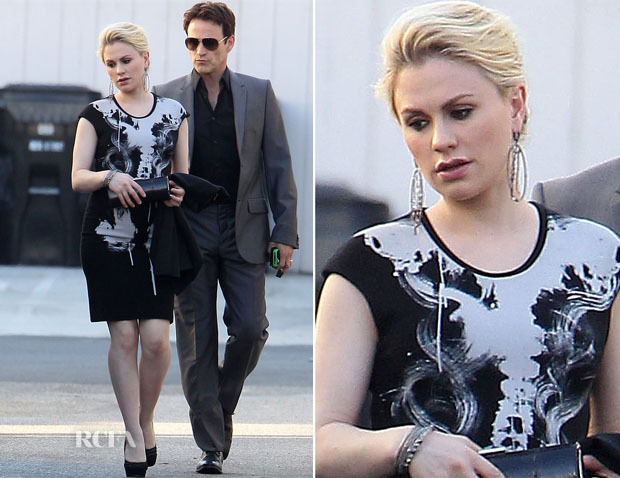 The ‘True Blood’ actress is still donning one of her favourite designers of maternity wear. 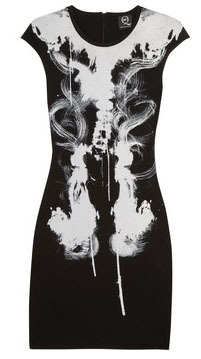 Dressed in an McQ by Alexander McQueen x-ray printed and stretch jersey dress with a body-hugging silhouette and cap sleeves, Anna amped up the look with a selection of silver statement jewels. Jimmy Choo accessories including a black tube clutch and black suede pumps were added to her look. The mother-to-be completed her look with barely there makeup. Net-A-Porter.com, my-wardrobe.com US and my-wardrobe.com.